In Cannon County, 40 projects were reported that still require funding. Those projects come at an estimated total investment of $114,667,000. Projects can include infrastructure needs such as transportation networks, stormwater control, public school buildings, drinking water and sewer systems. The TACIR report, “Building Tennessee’s Tomorrow: Anticipating the State’s Infrastructure Needs,” is the seventh in a series on infrastructure that began in the late 1990s. Released in September, the report highlights statewide infrastructure needs from July 2007 through June 2012, and puts a price tag for addressing those needs at a total of $34.2 billion. This represents an increase of $5.9 billion, or 21%, since the previous inventory— this figure includes the cost of upgrading existing public schools to good condition. Total infrastructure needs reported increased 21% since the last report, partly because of more complete reporting on bridge improvement needs. In the wake of the bridge collapse in Minneapolis in 2007, TACIR took a closer look at the information maintained by Tennessee’s Department of Transportation about bridge needs in the state and discovered that we had not been gathering all of it into the public infrastructure needs inventory. Consequently, this latest inventory includes nearly $660 million of bridge improvements that were not captured in earlier inventories. • Transportation and Utilities needs increased $3.2 billion since the last inventory and $12.5 billion since the ﬁrst, which is more than half of the total increase since that report. The Transportation and Utilities category now makes up 52% of the total infrastructure need in the current inventory. • Three other categories increased since the last report: Education (20.0%), Health, Safety and Welfare (29.9%), and General Government (32.2%). The increase in the Education category is the result of increased needs reported by the state’s higher education institutions. Growing law enforcement and water and wastewater needs are the main reason for the increase in the Health, Safety and Welfare category. Most of the increase in General Government needs is for new or improved public buildings. • Two categories decreased: Economic Development (-7.7%) and Recreation and Culture (-3.4%). 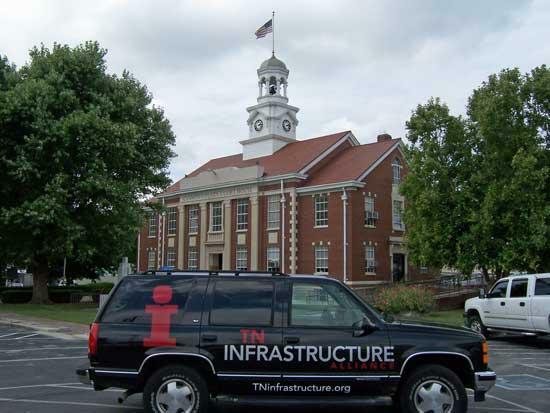 The Tennessee Infrastructure Alliance (TIA) is Tennessee's advocate for adequate infrastructure. By educating policy makers on the needs of the future, TIA helps Tennessee's communities plan to accommodate growth and promote commerce and safety. Beautiful Picture of the courthouse. I would have wanted to save that to my photo library if the truck had not have been in it. Nice shot.